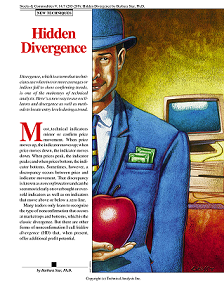 Divergence, which is a term that techni-cians use when two or more averages or indices fail to show confirming trends,is one of the mainstays of technical analysis. Here’s a new way to use oscil-lators and divergence as well as meth-ods to locate entry levels during a trend. Most technical indicators mirror or confirm price movement. When price moves up, the indicator moves up; when price moves down, the indicator moves down. When prices peak, the indicator peaks; and when prices bottom, the indi-cator bottoms. Sometimes, however, a discrepancy occurs between price and indicator movement. That discrepancy is known as nonconfirmation and can be seen most clearly on overbought or over-sold indicators as well as on indicators that move above or below a zero line.